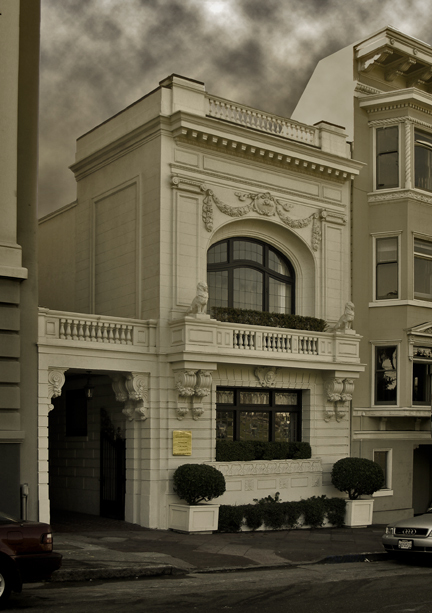 During one of his stays in the United States Sir Arthur Conan Doyle and his wife lived in this home in Pacific Heights. The French Baroque Revival home sits across the street from Lafayette Park and bears a brass plaque testifying to the writer's residence. While his famous detective Sherlock Holmes never traveled to San Francisco, a later Hollywood film, '1994 Baker Street: Sherlock Holmes Returns' has Holmes being frozen, waking up a century later in San Francisco and tracking down an evil descendant of Professor Moriarty. I'm sure Doyle is still spinning in his grave.